CREDITS: Fairs, festivals and corporate functions throughout the U.S. 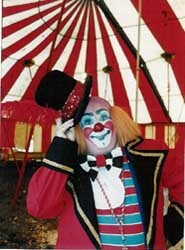 The Tom Thumb Circus is presented under its own tent, with its own seating for nearly 500 audience members. Clowns, jugglers, trained animal acts... never the same show twice! Complete, self-contained, and fully insured.